Hello friends and a happy Monday to you! 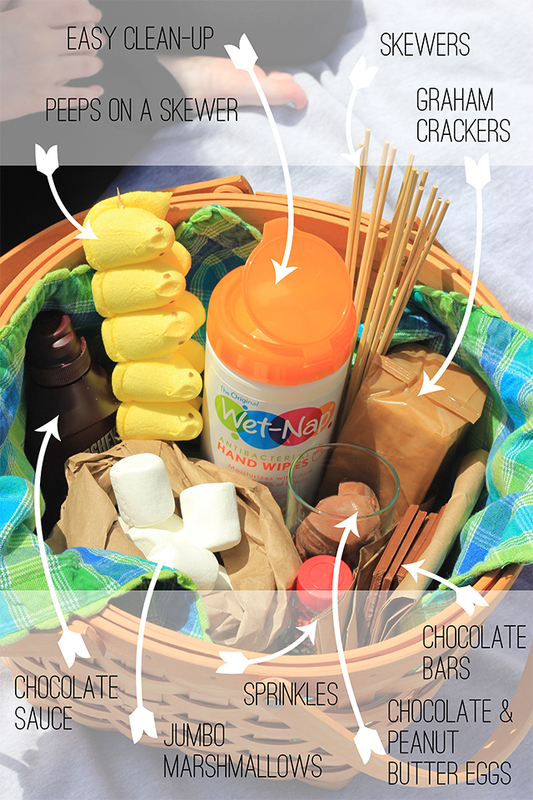 I'm excited to share with you a fun way to welcome spring and enjoy candy leftovers. Around our house, the Easter Bunny sent a few more Peeps and peanut butter eggs than all of us together can consume. This year, we used these treats in our own sort of welcome spring party. 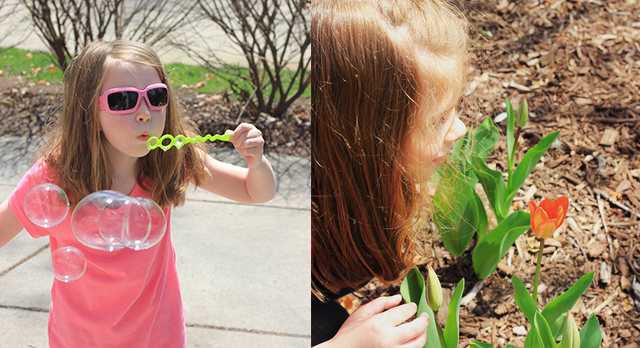 I know that it's been spring according to the calendar for quite a while now, but here in the Midwest the temperatures have finally turned warm enough for us to be outside doing our usual things - blowing bubbles, enjoying nature, and eating outside. So we put together a S'mores Bar in a basket. And then we fired up the grill to roast our marshmallows. 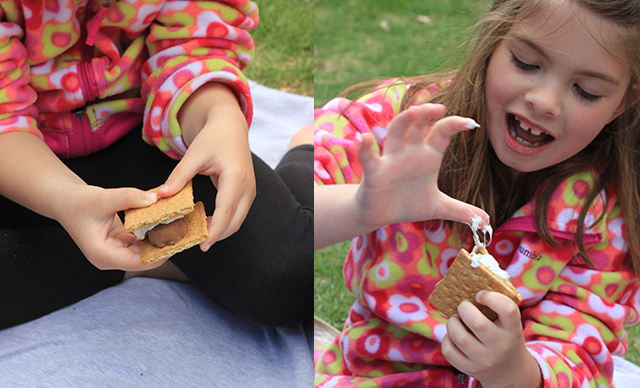 Each of my three children have distinct taste in s'mores (of course) so we added in a little something for everyone. M, the oldest, adores peeps and can gobble an entire container in a sitting. She created a peep-chocolate-chocolate sauce masterpiece that was delicious and a whole lot of mess. *Don't try this at home unless you have clean-up tools easily accessible. We kept a Wet-Nap pack with us to make sure we could do a quick wipe of hands, faces (and even hair!). C, our middle, is a huge fan of peanut butter cups (so am I), and she made her s'more with a peanut butter egg and marshmallow. In the end, she won for messiest with marshmallow on her face, hands, hair, and clothes! L, our youngest, is not one for getting too messy. He's also not a fan of marshmallows. So, he created a s'more with chocolate bars and sprinkles. 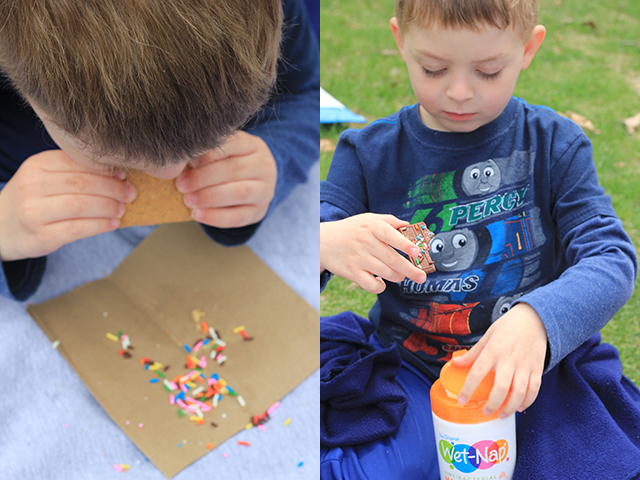 He pretty quickly ditched the graham crackers and had chocolate bars covered in sprinkles. It's a good combination - couldn't fault him there. We topped off our s'mores eating with a great game of wiffle ball, and it felt like the hibernation is finally over! Welcome spring. This week brings more sunshine, softball and soccer games, and some quality time breathing in the fresh air! 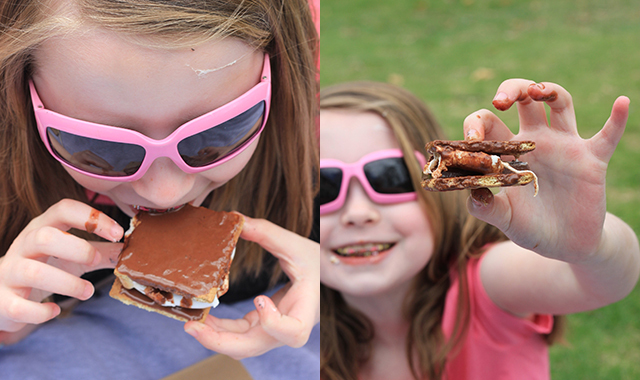 Have you made any s'mores yet this season? It's never to early to make the delicioius combination. P.S. 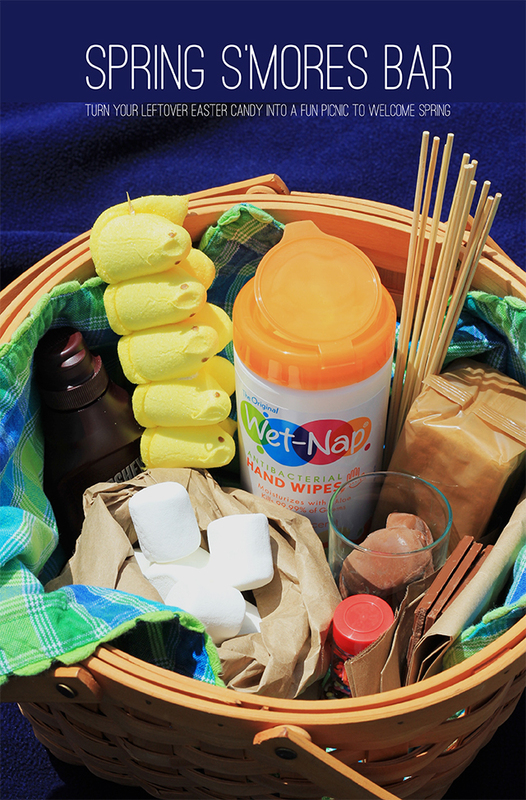 If you want to show off your messy ones and enter to win a $1,000 giftcard to Walmart and a year's supply of Wet-Nap click over to the contest that ends June 16, 2015. P.P.S. Print a coupon while supplies last for any Wet-Nap product over here. I grabbed ours at Walmart because, well, they have everday low prices.